This is the fourth installment of a five part series for sales professionals who want to get the most out of HootSuite for social selling. To simplify your social selling workflow, download the new HootSuite guide, Social Selling Action Plan: Closing the Loop From Relationships to Revenue. In previous installments of this series, we’ve explored how to use HootSuite to create a compelling online presence, listen to your industry, and observe real time buying signals from your prospects. 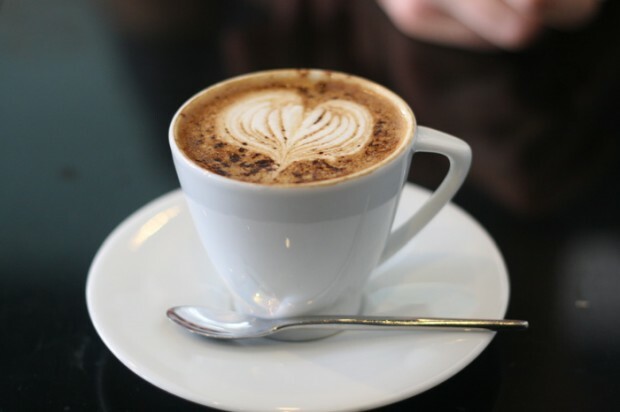 Now, let’s look at how you can reach out and engage prospects. The first thing to keep in mind is that social media isn’t an appropriate place for sales pitches. Your objectives for social engagement should be to gain a better understanding of your prospects, initiate dialogues, and build relationships that can open up new connections to decision makers. Social media is also just one tool in your toolbox. The key is to work it into an overall communication strategy in a methodical way. With a few non-interruptive communications on social media, you can establish a precedent for a personalized email or a phone call. Your prospects will actually recognize your name, and will have vetted you by checking out your social profiles (which are already optimized for viewing by customers, right?). Instead of consigning your email to the trash bin or hanging up on your phone call, they’ll be far more likely to give you a warm reception. Today’s buyers expect you to do your homework, not just about their company, but about them as individuals. You’ve got to know the professional concerns that keep them up at night. And it doesn’t hurt to know where they went to college, their favorite sports team, or their most passionate hobby. Researching your prospects on social media can give you that critical combination of substantive business knowledge and personal insight. The most effective way to understand your prospects is to integrate multiple sources of intelligence for a rounded, real time view. That means being present wherever they are on social media: LinkedIn, Twitter, Slideshare, Google+, Pinterest, and anywhere else you can find them. When you make new contacts, make sure to look for them on other channels for a comprehensive view. Be aware that Facebook is a highly personal network for most people, so err on the side of caution here. There should be no artificial barrier between your “social selling” activities and the rest of your sales process. This is especially true when it comes to relationship management. The leads you generate from social media and the insights you gain about your potential customers must be captured and integrated into your CRM records. You can save time and streamline your lead generation from social media by connecting HootSuite with your CRM system, such as Salesforce or SugarCRM. CRM integrations in the HootSuite App Directory allow you to gather personal and contextual information from social media profiles, then push it to new or existing lead records in your CRM, directly from the HootSuite dashboard. This will give you a rounded view of your leads that you can access at any point during your sales process. 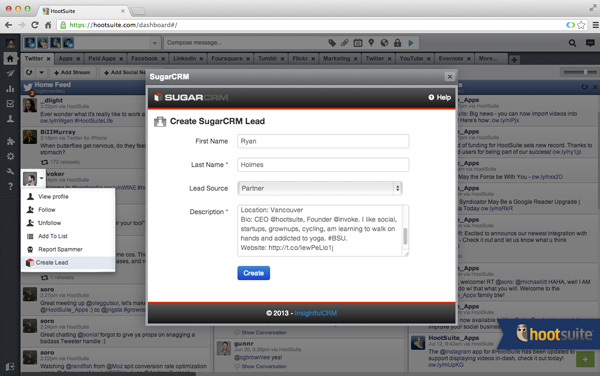 Sales teams can quickly identify and create Leads within SugarCRM from a social media profile within the HootSuite dashboard. Don’t overdo it. Retweeting everything your prospect says is just creepy. Too many retweets or shares will also clog up the timelines of the people who follow you, and there’s no point in alienating your larger community just to get the attention of one prospect. Liking or favoriting your prospects’ posts is a lower-key way to keep yourself on their radar. Again, there’s no need to overdo it. Pick the updates that you find most relevant and show where have you have common interests with your prospects. Reply to or comment on their posts. This is a more substantial form of engagement, and probably the most important. By replying to your prospects’ tweets and posts, you can demonstrate your expertise and willingness to help. Be on the look-out for questions, which are open invitations for you to engage. Remember, you can filter your Twitter search and Twitter list streams in HootSuite for tweets that contain the “?” symbol.